We've been hard at work on a long needed update to the share tool, that clunky old thing that loads up any time you click Share to Kinja. We've layered a lovely new interface over a few new features to create a super-charged share tool, available on all Kinja blogs today. Before today, sharing to Kinja opened an editor. What you did in the editor influenced what your share became, which wasn't apparent until the share was live. Now when you share to Kinja, you'll be welcomed by a preview of what your share will look like on the blog it has been shared to. Does the post you're sharing have a big image? So will the preview. Does it have a gif? So will the preview. A tweet or Instagram embed? You get the idea. The share preview is an almost-exact representation of what the post will look like on your blog's homepage — no more guessing. What do journalism, comedy, and running across subway tracks have in common? They're all high risk/low reward! Also, they're all about timing. That recently published post on Oppositelock is guaranteed to boost your traffic, but it's 2am. If you share it now, it will be second page news by time the morning rolls in. Scheduling fixes that. Pick a time that guarantees maximum visibility to your blog's readers and let Kinja do the rest. That post about tomato pies would be perfect on your Pizza blog! But you accidentally shared it to your Gluten-Free blog. Oops. 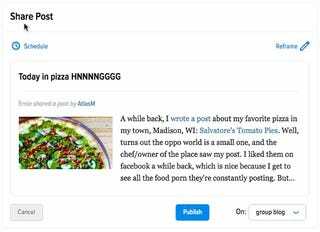 The draft page of your blog's private view will list all shares scheduled to publish to that blog, with the option to unshare directly from the stream page. No fuss. Your secret love for pizza is safe. Not all images are created equal. Large images are meant to grab your eye, and your click. If a post features a big pic, the share will retain the big pic. Icing on the cake. These features are available right now, so what are you waiting for? Share this post to your blog and marvel at the quality of life improvements. Support resources: How do I share a post? | How do I unshare a post?